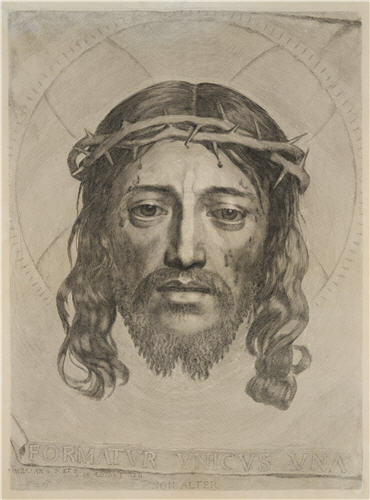 The Face of Christ was made by Claude Mellan. It relates to the miracle of St. Veronica who, on the road to Calvary, wiped the perspiration off Jesus’s face and an image of his face was miraculously transferred on to the cloth. This was Mellan’s most famous print; a remarkable demonstration of his virtuosity as an engraver, for it is executed with a single continuous line. Usually line engraving creates tonal variation through juxtaposition and cross-hatching of lines, Mellan developed a technique whereby he would control the swelling and tapering of his line to give greater or lesser emphasis. The text below the image, FORMATVS VNICVS VNA (‘the one formed in one’), is a pun on the uniqueness of Christ, the uniqueness of the miraculous image, and Mellan’s single line.